search 100 leaders of youth's most productive decade . Valuing Net Generation. review ONCE IN A GENERATION at youtube. Help Rank ER's top 50 pro-youth hubs and clubs. The Economist's quest for 10 times more economical healthcare 1984-2014.
could we be interpreting UNHabitat sustainability development goal 11 sustainable cities as call not to fiddle while all human cites in a world without borders burn ,,, Makes the road to the white house 2016 look like a white elephant? fiddle while Rome burns definition. To do something trivial and irresponsible in the midst of an emergency; legend has it that while a fire destroyed the city of Rome, the emperor Nero played his violin, thus revealing his total lack of concern for his people and his empire. 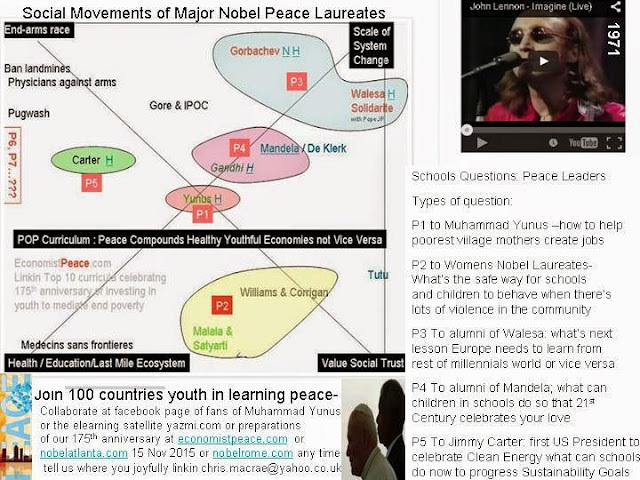 week 5 when 10000 youth converge on atlanta mid november 2015 will the best youtubes of lessons from Jimmy Carter, Luther King, Muhammad Yunus, 20 Nobel Peace Laureates, and the turner family as most loving mediators of US and UN be ready to POP the world? economistyouth.com suggests the following homework before 10000 youth meet 20 Nobel Peace Laureate, Muhammad Yunus, leading famkilies of peace such as Jimmy Carter's, Luther King's ,Ted Turners Atlanta November 2015- interview someone who was a teenager between 1946 and 2015- what was most pro-youth and most anti-youth event furing their 7 years as teens? ; the economic reason for doing this is that every 7 yeras from 1946 the world has been doubling its spend on global communications tech; that will 4000 times more spent in 2030 than 1946; orwell mapped one edngame of such a spean, can milennials social action the oppoiste impact? As an opposite end game to Orwell's Big Brotherdom, 1984 saw the publication by The Economists's unacknowledgded giant and me of a book mapping how 2010s could be worldwide youth's most productive decade. 0) Online media would need to smarten up every trillion dollar market that that tv mas media had dumbed down. 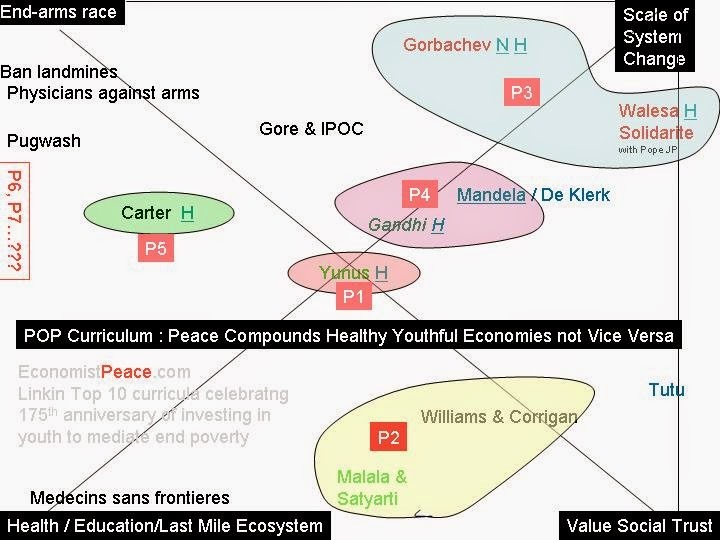 MOOCs would be needed to empower youth collaborating around the 21st Century's most exciting goals : 1.1) external peace, 1.2) internal peace, 2) green systems : 2.1 energy, 2.2 food and 2.3 water security, 2.4 valuing zero carbon waste, 3) education value chain would need total context up and open collaboration transformation- new economics and financial literacy curriculum would be needed at every grade, 4) 10 times more eonomical community banking needed to be celebrated, 5) 10 times cheaper healthcare would require opposite systems than 10 times more expensive healthcare. 5.1 nutrition should be made with arms and minds reach of desire, . 6.1 service and knowledge network economics could be abundant in way that industrial age's consuming up things was scarce, 6.2 gross world product would depend on maximising every human beings productive lifetime not adding up gross national products, 6.3 national government would need to be minimised so that community public servants impact could be maximised, 6.4 expoenetially transparent professions would need to internalise everything that had made them big during 20th by externalising, 6.5 win-win-win models (and capital strutures investing family's savings in next generation productivity and sustainability) would need to have zero tolerance for those who aimed to profit by compounding conflicts.